"It is said this otherworldly beauty was destined to rule the galaxy, but some think she was manufactured specifically to replace the current queen. Others claim she is but one in thousands from the same android line. Whatever the truth, the wise would do well to not underestimate Lady Stardust." Includes two complete texture sets, plus colour stripe variants so you can customize her to fit your universe. There's also emissive, translucency and eye presets to make her truly otherworldly. 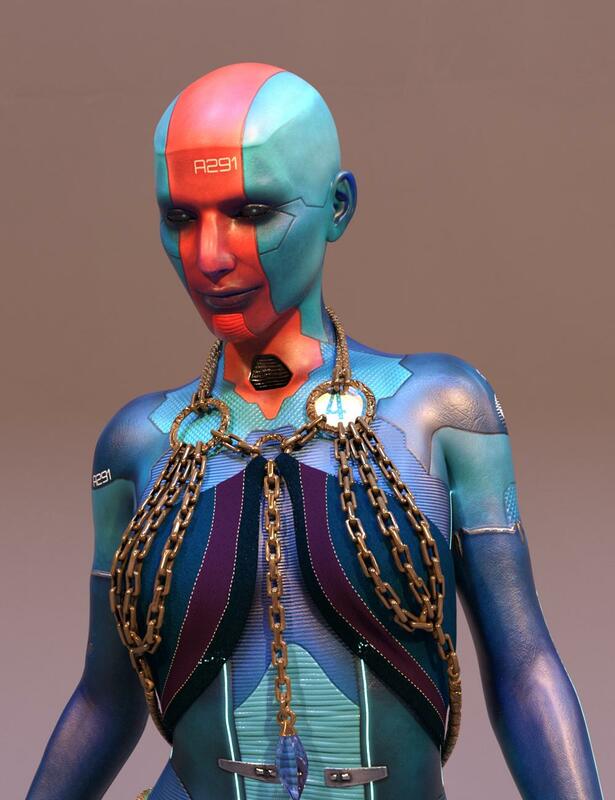 There's also a skullcap wearable anatomy piece with a posable set of cables -- as if this android lady pulled herself out of some console to take on the galaxy -- or in the case of the promo below, to give a very intriguing TED talk presentation. I welcome feedback. If she does well, I'm hoping to add more characters to my catalog in the future. Wanted someone to do Iray-era cable hair for cybernetic characters, for ages! Would still love someoen to do some for Genesis 3, but this is delightful, regardless. Could someone please post what she looks like without Zelara dialed in? Zelara didn't really catch my eye, but this character sure did! Awesome. The skullcap was pretty fun to make, I've been pondering doing a set with just those sorts of wearables and nothing else if I can squeeze it in during upcoming enviro sets. Stardust dialed in 100%, Zelara 0%, so just Genesis 8 base showing. The Lady Stardust shape is fairly subtle. The main things are the head crease and throat vent, but there's some minor adjustments to her chin, cheeks, shoulders, arms as well. No postwork, just threw her in there with a basic light probe + backdrop. She is absoulutly stunning! I love her! I usually don't buy all that many characters anymore outside of what comes in the probundles themselves, I have amassed quite a few, but I had to have her! She's so unique, reminds me a bit of Nebula from Guardians of the Galaxy. And the ripped out cable prop is epic! Can't wait to mess around with her some more, she's beautiful! Thank you for making her! That's great! I saw it in the gallery earlier. 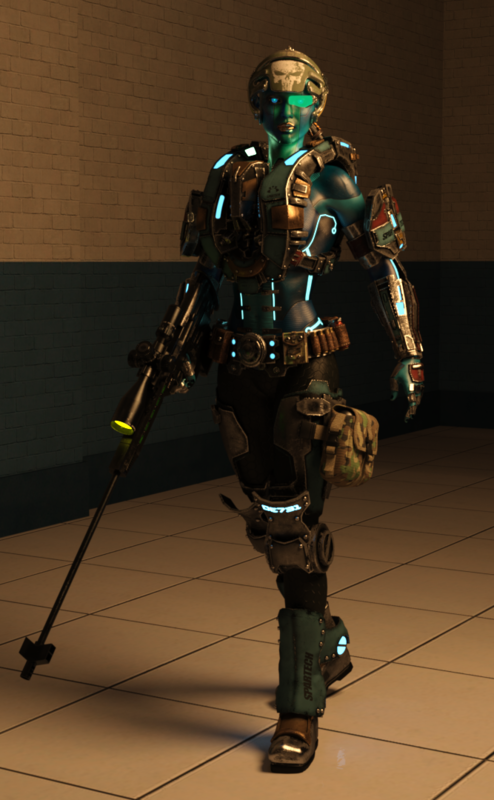 I wish I had done better promos to show off the emissive options, but I completely overlooked it. Thanks! Yes, she does look very subtle, but her textures are amazing! I can't believe this is your first character! Bravo! You hit it out of the ball-park! I look forward to seeing what you'll create next! She is just gorgeous. Are there seperate mat zones on her, like, could you make the stripe V8 s skin and leave the rest of the face blue? Thanks! Sorry, there's not seperate mat zones. The stripes and tech markings are layered image presets so they can be applied to any other character though the stripes might look a bit strange around the neck and chest since there's no vent and plastic parts to match to. I thought I had a test render where I put a red stripe on the base Zelara skin, but I apparently didn't save it or else I'd share it here. The reverse won't work -- you can't put V8's skin in place of the stripe, without doing some texture edits.